Neon Haze is this week’s release at Sub-Q Magazine. A side note: If you are interested in IF, especially Twine IF with a speculative fiction focus, you should be paying attention to Sub-Q: it’s an ambitious venture, a website with stories and interviews that pays pro rates for interactive fiction. It provides some resources for matching storytellers with people who can implement content for them, if the author doesn’t already have those skills. The guidelines would allow for parser IF, but possibly they simply haven’t been offered any so far that met the other requirements. Sub-Q is paid for by memberships and donations, but it’s free to read; I’d like to see it continue, though, so I’ve signed up. So, Neon Haze. It is the story of someone living in a dark-rainy-night-plus-neon kind of environment. The protagonist suffers from Vessel Syndrome, a condition that produces a sense of not really being oneself, or not being in one’s own body; a sense of being occupied by other spirits. Sometimes they seem to dissociate. Often they use language drawn from therapy sessions to describe their experience. One of the game’s key moments comes when you’re allowed to choose which of two people you were in a scene: someone safe and surrounded by friends, or an outcast who has gotten into a fight? Whichever you choose, the game does not contradict you, and either way provides an interesting way of understanding the situation. Perhaps the protagonist has always been an outsider and imagining themselves as someone different and safe was a way to escape that experience. Or perhaps the protagonist comes from a background of safety that is now lost, one in which they acted entitled and did not understand how difficult things could be elsewhere, on the outside. The story is supported by CSS effects that make the links glow on the page against a dark cityscape, and by Neotenomie’s music, which loops and hums with seductive energy. Sometimes, at least for me, the music was more than a mood-setting device. It communicated hope, or perhaps some not-quite-hope will to live, even when the text itself was describing a bleak situation. The themes of damage, of past and present abuse, of body horror, of being trapped in environments that dehumanize and resist our attempts to express individuality; of fracturing mental state, of unusual forms of currency as a comment on our economic systems and forms of value, of trash as a token of individuality — all these are familiar in Porpentine’s work and especially recalled Their Angelical Understanding. I have some thoughts about the ending, but I’ll stick them behind a spoiler space. At the end, the protagonist experiences something akin to a mystical vision of connection and beauty (unlocked, somehow, by the change from the zero-dollar bill), and she has the opportunity to choose whether to leave it or return to it. At this point, she has lost access to her stabilizing medicine: the screen-faced stranger took it away and flushed it. She imagines herself being able to enter others’ minds the way she has imagined others entering hers. The way I read this, she was losing her hold on reality, and the final choice is a question of whether she has the will to return to it, whether she even wants to return to it. And I was divided, because on the one hand I wanted the protagonist to be well, and on the other the floaty vision world was so much nicer, so much more welcoming, than the reality depicted up to this point in the game. 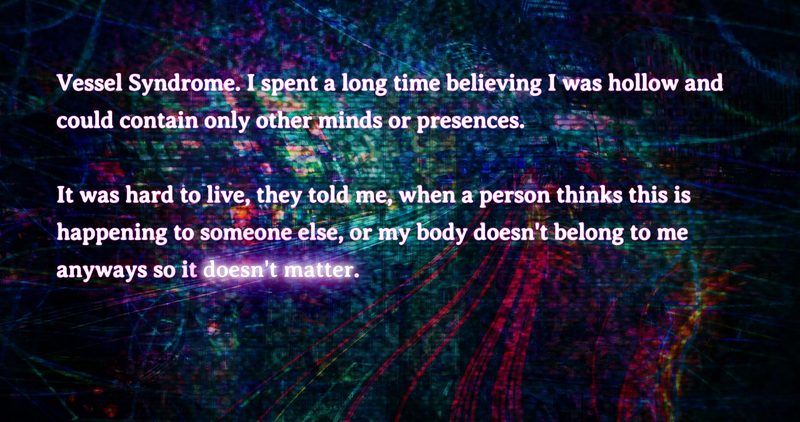 In contrast with some of Porpentine’s other work, there’s not really even one character in Neon Haze who is presented as a friend or ally of the protagonist; there is no one whose companionship we might prefer over a delusional fantasy. This ultimate choice reminded me of how, in some circumstances, mental health requires turning away from a particular habit of mind or behavior, even if that habit was originally established as a survival mechanism. It reminded me of how the loss of that habit can leave the world comparatively drab. This entry was posted in CYOA, interactive fiction, Reviews and tagged brenda neotenomie, porpentine by Emily Short. Bookmark the permalink. Huh, now all links work. Must have been a temporary glitch. Sorry about that!